This is just what I had been looking for. I have to carry groceries up a flight of stairs. This has solved my problem, I love it. I would recommend it to anyone. It was worth the money. I love it. I am getting ready for shoulder surgery and this product is great. 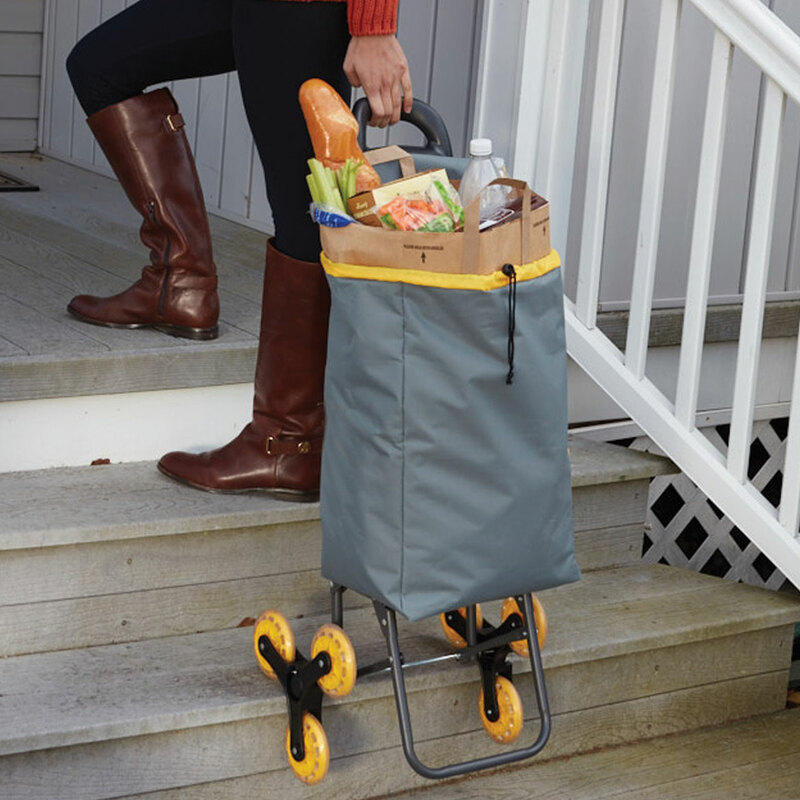 I can put my groceries in the bag and bring them into my home. I can also load my laundry up in the bag and not worry about carring it to the laundry room in my basket. It climbs the stairs just like it said it would. I would recommend it to all those who are handicapped like me. I would be happy to promote this product. This helps carry some of the heaviest items of groceries, like 2 liter drinks and cartons of canned drinks from my car to inside the house. It is sort of small and doesn't hold a lot of grocery bags, but it beats carrying all that weight hanging on my hands from the bag straps. It is a handy tool to use, but still might have to make a few trips since it doesn't hold a lot. Still glad I got it though. It serves what I want it for. This is a sturdy little carrier that I use for my art painting supplies when I go away from my car to paint en Plein Air. 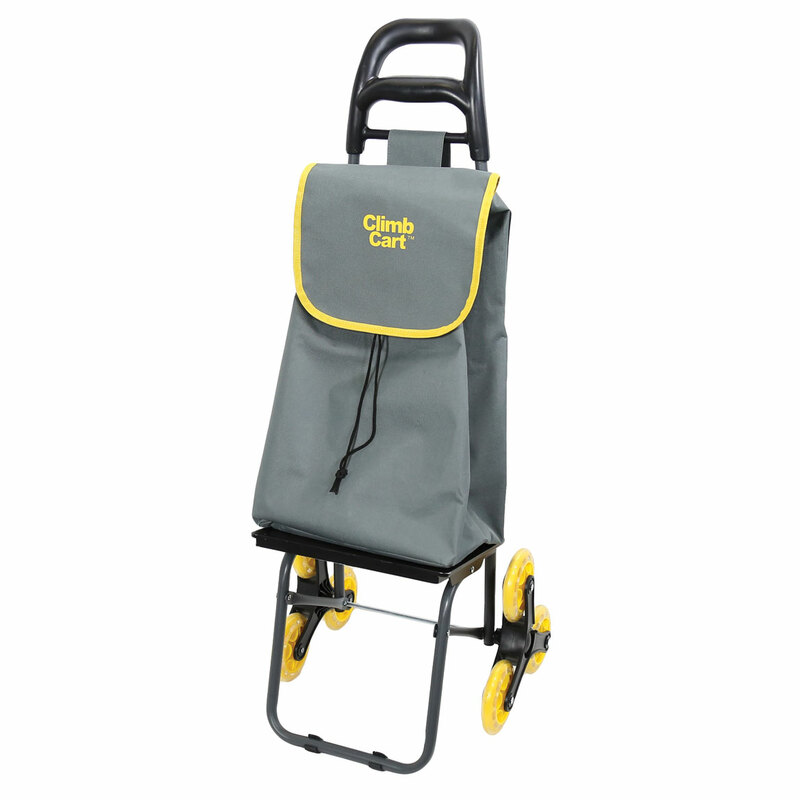 It rolls easily over rough terrain, is very spacious for my supplies, and folds flat in my car for my convenience. I love it. Great gadget! But needs a longer handle! Friend lives up two flights of stairs. To carry groceries up a flight of stairs. I can’t wait to get this hopefully it make life easier for me . Needed it to carry a book bag for college. I don't walk as well as I used to and this looks like it would be helpful getting the shopping into the house. We are getting older and have a split foyer home. Carrying groceries up is a real chore, so this will hep. I'm disabled and need all the help I can get going up and down stairs....hope this works for me!!! mother bought one and it is great. Live on the second floor thought it would help getting things up the stairs. I think I would like it because of the wheels, and because I wouldn't have to make as many trips to and from the car. I picked this item to help my sister carry her produces up stirs easily. My daughteer lives in a 2 story apartment and it is hard for her to carry up her purchases. I think it will be very useful for me to carry my groceries, etc. from my car and up onto my porch. My daughter has steps front, back and basement. I want to make it easier for her when she has groceries to take in. To help bring my groceries up a flight of stairs. Sounded like it would be a good idea for me, as I am alone and carry all my packages up stairs from my garage into the house. This is for my 80yo sister who has a good many steps to encounter after grocery shopping. This will help get them in the house. To haul groceries up to kitchen (on the second floor) from car. I carrying few cases of water bottles to upstair. Hope it help rather than carrying it on my arms. To carry groceries up from my garage located under our living quarters. I and my husband are in our late 80s and getting our bags into the house is not easy. Never used this before but have many uses for it, I teach Sunday School and constantly caring items to class room. I have two flights of stairs to climb twice a day sometimes more. This will be very handy for me. Having problems lifting laundry basket up and down stairs, thought this would help! What's the bag made out of? BEST ANSWER: Thank you for your question. The bag is made of Heavy Duty Canvas with a moisture resistant lining. We hope this information will be of help to you. The label inside the bag has a label saying it is 100% polyeser. This item is not working for me at all! It's more trouble than it's worth! If it did work, it would have been great! ? BEST ANSWER: Well, it does fold down ; to half it original size. About 15 inches. If you are tall, I am short ( 5ft. 2in. ) I really wouldn't recommend buying this item. The simple fact is , the whole cart is small and the handle is also short. I had to return mine . the wheels work fine but I had to bend over to maneuver it. If you want to use the bag that comes with it ( to carry groceries ) don't hold much . I chose to return the one I purchased, and it cost me half of the cost to send it back. I find that I am better off with my shopping cart. I do hope I answered your question? It goes from about 36" or so to about 24" x 18* and folds nearly flat into a small trunk. Very lightweight. I hope this helps. what is the sie of the deluxe climbcart? BEST ANSWER: Not sure if you want overall folded dimensions, unfolded dimensions, or bag dimensions. I'll give you all three. Folded, the cart measures 23.25"H x 14.75"W x 10.5"D. Unfolded, the height is increased to 37.25" and depth to 16.5". 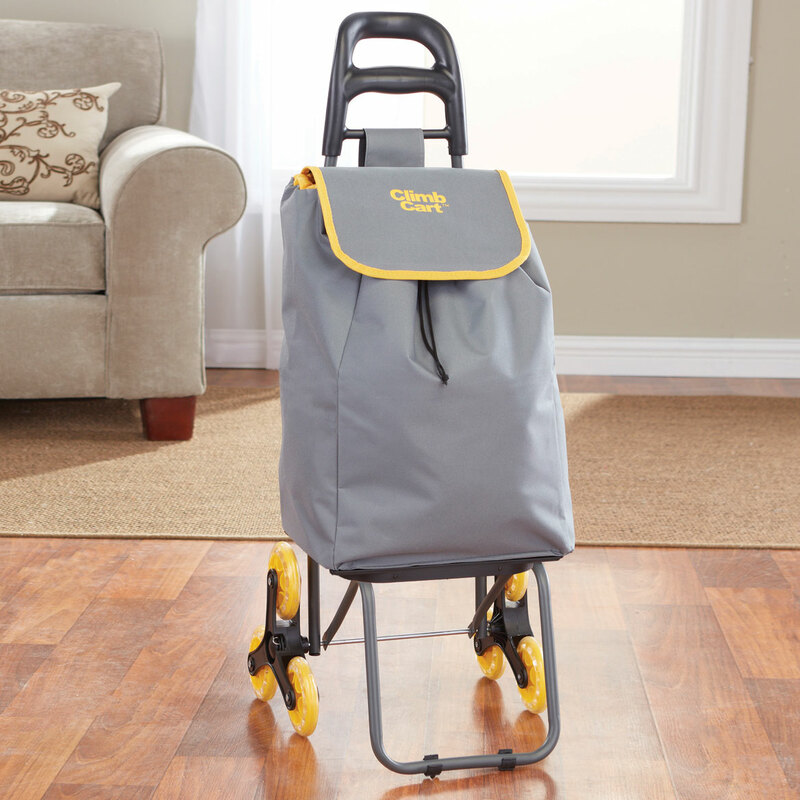 The bag measures 19.5"H x 11.5"W x 8"D. The small platform measures 11.25"W x 5.25"D. The platform may seem small, but if you use the included bungee cord, you can haul larger items. I set a large suitcase on it sideways, use the bungee cord to secure it and rolled it up a set of stairs. It seems sturdy. 37 1/4” H x 14 3/4” W x 17"
Does this cart move over gravel as well? BEST ANSWER: Thank you for your question. Yes, it will move over gravel. We hope this information will be of help to you. Would this work in the sand at the beach ? BEST ANSWER: Thank you for your question. No this will not work well with sand. We hope this information will be of help to you.